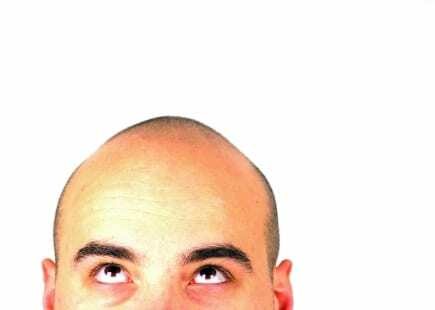 Almost half of all men will eventually be affected by male pattern baldness. This form of hair loss, which begins above the temples, continues to form a characteristic “M” shape and sometimes progresses to complete baldness, has been shown to be related to certain hormones, such as testosterone, called androgens. Genetics has long been known to play the dominant role in determining whether a man would go bald, but it wasn’t until 2005 that a specific gene was connected to male pattern baldness. The gene, which encodes an androgen receptor (AR), is on the X chromosome. This means that men inherit only one copy of the gene, and that this copy always comes from their mothers. It’s possible that this is part of the reason behind the adage that male pattern baldness skips a generation. But the AR gene doesn’t completely explain the inheritance of male pattern baldness, suggesting that there are still genes to be found. New research, published online Sunday in Nature Genetics, provides evidence that one of these genes might be on chromosome 20. Axel Hillmer and colleagues at the University of Bonn in Germany, who were involved in the research that first connected the AR gene and baldness, have now shown that the approximately 80% of Europeans with one or two Ts at rs2180439 have increased odds of male pattern baldness compared to the men with two Cs. Just how much these odds are increased depended on how the researchers conducted their experiments. In one sample, 296 Germans who went bald before age 40 were compared to 347 male and female German controls, some of whom may have had some degree of balding. The researchers found that each T at rs2180439 increased the odds of male pattern baldness 1.82 times. But in another sample, 319 bald German men were compared with 234 German men who had made it past age 60 without going bald, and the authors found a 2.17 times increase in odds for each T.
Richards et al conducted an independent study of baldness in more than 2,700 men from Switzerland, England, Iceland and The Netherlands. They found a different SNP on chromosome 20 linked to male pattern baldness. Each A at rs1160312 increased the odds of baldness by 1.6 times over men with two Gs. 23andMe does not currently provide data for this SNP. There is no obvious direct connection between the SNPs the two research groups found, but the fact that they independently linked chromosome 20 to male pattern baldness suggests that scientists may be zeroing in on another “baldness gene.” Finding this gene and the causative variation for baldness could have implications for research on several other common medical disorders which tend to be associated with baldness: coronary heart disease, hypertension and insulin resistance. Discoveries about the genetics of male pattern baldness could also lead to new treatments, which according Richards et al is really big business. They cite financial disclosures from Merck that said global annual sales of an exisiting medical therapy for male-pattern baldness at upwards of $405 million. “Clearly most men know if they are bald or not — but early prediction before hair loss starts may lead to some interesting therapies that are more effective than treating late stage hair loss,” said study author Tim Spector, of King’s College London, in a statement.